Disclaimer: Some of Grit HQ's links are affiliate links, which means that if you click our links and decide to make a purchase, we may get a small commission from your purchase. Our promise to you is to recommend products or services we've thoroughly researched or used ourselves. Thanks for supporting Grit HQ! Do you use an excel spreadsheet to keep track of donations? Maybe you have that long notes section that reflects most of the donations that have come in over the last few years... well, except for those three months the volunteer bookkeeper was on maternity leave. We know you're out there! We've all been at or worked with that nonprofit. Keeping track of your donations has its limitations. Stop leaving thousands (probably at least tens of thousands) of dollars on the table by trying to save $468! You might think you are being fiscally responsible by saving money, but you're doing your nonprofit a disservice. You need to upgrade your donor management system! Before I tell you that Little Green Light is your answer (it is! ), I have to confess: I'm a huge fan of both Raiser's Edge and Donor Perfect. Little Green Light, Raiser's Edge NXT and Donor Perfect are all cloud-based donor management platforms for nonprofits. Raiser's Edge is a super user-friendly, cloud-based software integrated with Blackbaud's accounting software to avoid dual entry. Click here for Andrew Dain with Neon's more robust review of Raiser's Edge NXT. PRICETAG: Contact vendor for pricing. Donor Perfect is an easy-to-navigate cloud-based database that integrates with Constant Contact + Quickbooks ($269 per month). Donor Perfect has a pretty baller, easy-to-use reporting system. If you're a numbers nerd like I am, you can analyze everything! These donor management systems are great, but one of my clients got me tuned into Little Green Light. Little Green Light is the best affordable and "good enough" donor management system Grit HQ has come across. This platform was designed for smaller-to-midsize nonprofits that want to work smarter - not harder - to connect donors to your mission. For its pricetag of $39 per month, this donor management system rocks! Plus, you can try Little Green Light for 30 days free. Little Green Light doesn't have all of the bells and whistle when it comes to reports, but it does the minimum that you need to effectively and efficiently manage your donors and cultivate your relationship with them. "I have been using Little Green Light since 2011. over the past 7 years, Little Green Light has matured into a robust donor management system at a very reasonable price and has given us the ability to easily communicate with our donors and effectively analyze our donor base." 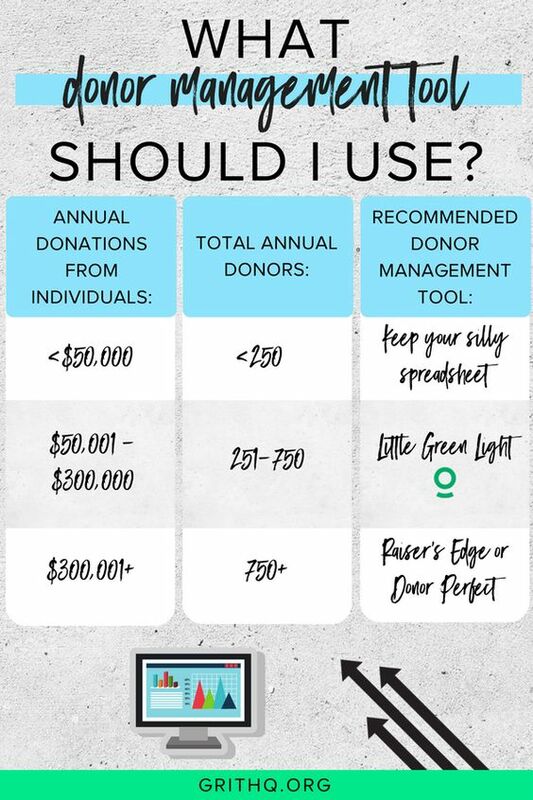 In upcoming blog posts, Grit HQ will be showing you donor management system how-tos and walking you through how you can transition from your silly little spreadsheet to Little Green Light! Click here to start your free 30-day trial with Little Green Light! How does your nonprofit manage its donors? Do you have any questions about upgrading to Little Green Light?